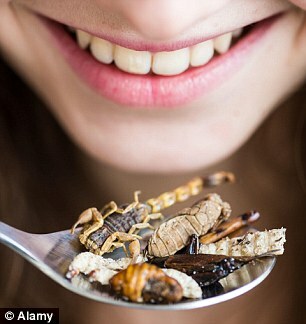 For most of us the thought of eating insects might prove to be one culinary step too far. But the consumption of locusts, crickets, worms and grubs could become very much a part of our diet as the cost of meat production rises, and the demand for meat grows. In tonight’s final episode of BBC Two’s Back In Time For Dinner, the Robshaws – Brandon, 53, Rochelle, 52, and their children Miranda, 17, Rosalind, 15 and Fred – who have travelled from the 1950s to the end of the millennium are served the food of the future.